B-52 Matrix-200 we offer you the lowest price. The MATRIX-200 is the most compact member of our popular B-52 MATRIX family of active systems. 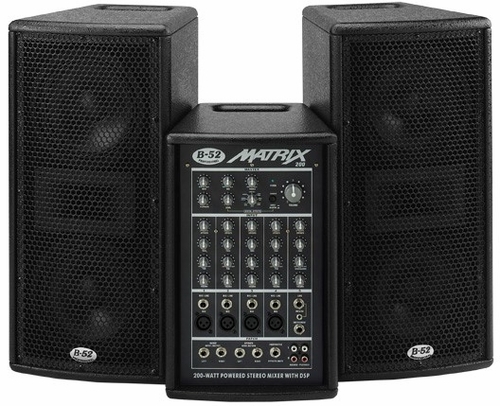 Compact, powerful and portable the MATRIX-200 delivers clean, accurate sound ideal for both stage and music playback applications. The MATRIX-200 has a true 200-watt RMS stereo amplifier, built in 5-channel mixer, studio-quality digital effects, phantom power and numerous patch inputs / outputs. Speaker Outputs:�Two 100-watt full-range outputs. The frequency response is equalized to optimize the acoustic performance of the MATRIX-200 speakers. Headphones:�A 1/4” TRS phone jack stereo output is included for monitoring by headphones.